Jason Dufner, the 36-hole leader, followed a record-tying 63 with a 71 to drop a stroke off the pace. Furyk more than made up for that miscue with his finish. Two brilliant shots set him for a birdie at the 17th, the toughest hole on the course. With some clutch putting at the end, Jim Furyk headed to the final round of the PGA Championship with a one-shot lead. Furyk shot a 2-under 68 on Saturday at Oak Hill, capped by an 18-foot birdie putt on the tough 17th hole and a gritty putt from the fringe to save par at No. 18. The 43-year-old American pumped his fist emphatically and headed off to the clubhouse, out front heading to Sunday in a major for the first time since last year's U.S. Open. At Olympic, he lost out on his second major title with two bogeys on the last three holes. Furyk was at 9-under 201. Henrik Stenson was 7 under after a 69, with fellow Swede Jonas Blixt another stroke back following a 66. On a warm, sunny day when Oak Hill finally showed its bite, Furyk bounced back from a sluggish start to seize the top spot on the leaderboard. giving him another shot at adding to his lone major title in the 2003 U.S. Open. Beginning the day two strokes behind Duffner, Furyk lost even more ground with bogeys at the second and third holes. A birdie at the par-5 fourth turned things around, and he had only one stumble the rest of the way, a bogey on No. 15. 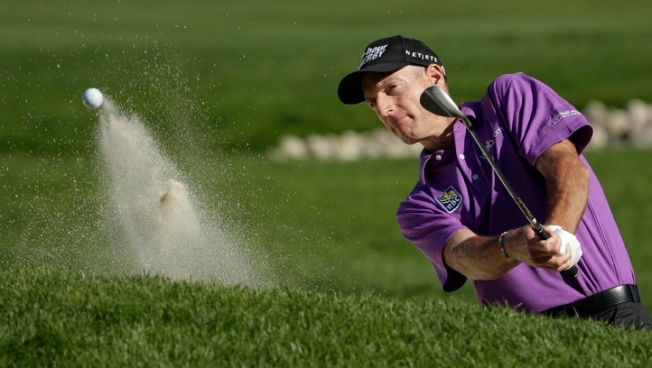 Furyk more than made up for that miscue with his finish. Two brilliant shots set him for a birdie at the 17th, the toughest hole on the course. Then, after an errant drive on 18, he managed to punch one out in the fairway, knocked a wedge to the fringe of the green and sank a tricky putt he managed to keep on line through the higher grass on the fringe. Dufner made his biggest mistake of the week so far when he dunked his ball in the creek on No. 5, leading to a double bogey. But he caught a break on 18 when his short putt spun all the way around the back of the cup and fell in for par, leaving him right in Furyk's rearview mirror. Stenson had his third straight round in the 60s to set up a shot at giving Sweden its first male major champion. If he can't do it, maybe it will be Blixt, whose 66 sent him flying up the standings on a day when a number of players headed the wrong way. Matt Kuchar struggled to a 76 and found himself a daunting eight shots behind. Robert Garrigus fell back with a 74. U.S. Open champ Justin Rose saw his chances of a second major title slip away with an ugly 77. Masters winner Adam Scott also dealt with some wayward shots, but he shook off a double bogey at the 16th to get home with a 72, leaving him tied at 5-under 205 with ageless Steve Stricker (70). Dufner was coming off a 63 Friday that tied the major championship scoring record. In fact, 27 players were under par after 36 holes — on a course that doesn't give up many red numbers. Oak Hill looked more like itself Saturday. With so many players faltering, defending PGA champion Rory McIlroy charged into contention. The 24-year-old birdied the last two holes — quite a feat, indeed — for a 67 that pushed his score to 3-under 207. He chipped in at the 18th, pumping his fist as he went to retrieve his ball. Over his last 25 holes going back to Friday, when it looked for a while as if he might miss the cut, McIlroy is 7 under with only one bogey. After a season-long slump that included missing the cut at the British Open, he suddenly looks more like the player who romped to a record eight-stroke victory at Kiawah Island last year, earning his second major championship. "It's getting there," McIlroy said. "It was good to feel that sort of rush again." Phil Mickelson and Tiger Woods headed in the wrong direction. Mickelson, who won at Muirfield just three weeks ago, was next-to-last among the 75 players making the cut after an ugly 78 left him at 10-over 220. Lefty had a triple bogey at the seventh, then a double-bogey at the 14th when he chipped through the green twice before finally getting one to stick. Coming off a seven-stroke victory at the Bridgestone, Woods turned in another mediocre round (73) that ensured another year without a major title. He was at 4-over 214 — a staggering 13 shots off the lead. Woods will go to 0 for 18 in the majors since his last win at the 2008 U.S. Open. "Well," he said, "it was hard to me. I didn't play very well today. I didn't hit it very good, didn't make anything, kept blocking every putt. So it was a tough day."